Let’s start with the most obvious question first – What is metabolism? The amount of calories you burn in a day is a result of the millions of chemical reactions that occur in your body in order to sustain life. We measure the amount of energy that is used by our bodies in either Calories or Joules, both are really nothing more than simple measures of heat energy. This ‘calorie cost of metabolism’ is what we refer to as your metabolic rate – simply how many calories you burned in a given period of time. This is what most people are thinking of when they say ‘metabolism’ – the amount of calories you burn in any given day. 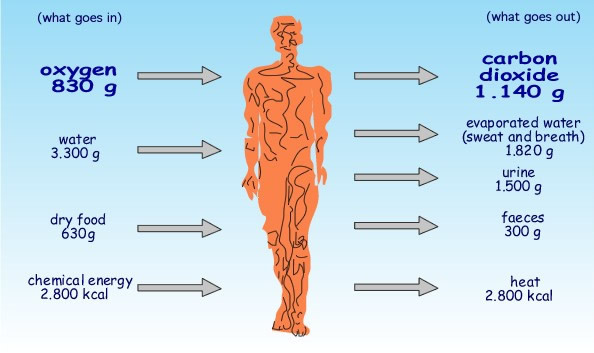 Now here is where it gets really interesting: The metabolic rates in different parts of your body are not all the same. Some parts of your body need more calories than others because they are more ‘metabolically active’. In other words in the ‘active’ tissues their are more chemical reactions happening than there are in the ‘less active’ tissues in any given time period. To be clear, this difference can be extreme. Consider the highly metabolically active tissues such as your heart, brain, kidney and liver may burn well over 200 calories per pound per day! In fact, when you are resting, your heart, brain, kidney and liver will make up over 80% of the calories you burn in any given day . Compare this to the metabolically inactive tissues of your bones, fat and muscles. While at rest (not exercising) these tissues barely burn more than 5-6 calories per pound per day. And herein lies one of the biggest myths of metabolism – that it is your muscles that drive how many calories you burn in a day. Each pound of muscle in your body burns about 5-6 Calories per day while at rest. This is much closer to the 2 calories per pound that your body fat burns than it is the 440 calories per pound your brain uses per day. I know this may seem shocking, but it really shouldn’t be. The truth is, we know a lot about metabolism, we’ve also been studying it for a long, long time. This information just gets conveniently forgotten when we are dealing with health and fitness. The first recording of scientists measuring metabolic rates occurred in 1780, when Lavoisier and La Place measured animal heat production, then in 1785 they were the first to study heat production in humans . We have well over 200 years worth of research on human metabolism. These days, we measure metabolic rate using something called indirect calorimetry. We can measure the amount of oxygen a person inhales and the amount of carbon dioxide they exhale and use these measurements to calculate their energy expenditure. This measurement technique is by no means perfect and by it’s design can produce false readings through human error. To be done accurately energy expenditure testing must be conducted with rigorous adherence to measurement conditions, including ensuring subjects avoid exercise, stressful situations or stimulants for at least 8 hours before the test. The test should be conducted in a room that is at a comfortable temperature while the subject is laying down and not moving, and the entire process must be done AT LEAST 4 h after a meal. While this sounds relatively easy, I have been a subject in tests of metabolic rate where I was late, ran across a parking lot, up a flight of stairs, got into the testing room, sat down and five minutes later data was being collected on my supposed metabolic rate while at rest. So human error and the stresses of every day human life can really affect measurements. Based on this information you can see that measurements are tricky to make accurately, and are prone to human error, but this still doesn’t explain our general misunderstandings of metabolism. It was in the mid 1950’s when we discovered that our Lean Body Mass (everything in your body that isn’t fat) is the main contributor to the amount of calories we burn when we are at rest. As far as I can tell, this is where a large part of the confusion started to set in. Most people think lean body mass simply means ‘muscle mass’. We also assume that all lean body mass is heterogeneous. – a fancy way of saying it all burns the same amount of calories. But as we now know, nothing could be farther from the truth. It was in the late 1990s when we discovered that our organs all had very different metabolic needs. Using some amazing experiments we discovered that our hearts had a metabolic rate almost 33 times higher than our muscle, and our brains had a metabolic rate more than 50 times higher than our body fat. Even though we knew the precise metabolic needs of our internal organs, the general fear of damaging our metabolisms had already set in. As is always the case, the popular fitness media had a louder voice than the scientists and people were convinced if they gained muscle they would massively speed up their metabolisms and if they tried to lose weight this would lead to drastically lowering their metabolic rate. How do you tell when a persons metabolic rate is appropriate for their body size? After all, your metabolism can only be ‘slow’ or ‘fast’ when compared to some kind of standard, however defining what the standard should be has been incredibly difficult. The metabolic rate that a person has when they are obese cannot be the standard since it is artificially elevated by being obese (remember, an obese person will typically have a slightly higher metabolic rate than a lean person). And it can be further enhanced by insulin resistance, diabetes or cardiovascular disease, which are typically associated with obesity. The act of eating can also raise your metabolic rate since it costs energy to digest and assimilate foods. So is the metabolic rate of an incredibly well fed individual a good standard, or should we use the metabolic rate when they are fasting? Answering the question ‘how many calories should I burn in a day’ is very difficult. So far the best we can do is compare your metabolic rate to a group of people who are the same gender, age, height and weight… and see where you ‘fit in’. This is exactly what all of those popular metabolic calculators do – compare you to an average of a bunch of people who are similar to you. Of course this has it’s own set of problems. Some of the equations we developed can overestimate metabolic rate by as many as 500 calories in a day (oops). And, even the more sophisticated equations cannot account for changes in lean body mass due to resistance training. In fact, it has been suggested that for the most popular equation – the Harris Benedict equation women should subtract 738 calories from the answer to get a more accurate estimation of their true resting energy expenditure. 738! So right away you can see that this formula assumes a heterogeneous lean body mass (it assumes all lean body mass is the same). Let’s run this equation on me. My latest DEXA measured my Lean body Mass at 154 pounds or 70 Kilograms. However, my resting metabolic rate was measured to be much closer to 1800 during a separate clinical test. Well, this equation assumes as certain ratio of muscle mass to the rest of your lean body mass. Since I’ve gained muscle from weight training, my ratio is slightly different, thus skewing the results towards having a higher predicted metabolic rate. Now let’s run the equation again. Only this time we’ll use the Adonis equation to predict my ‘non trained’ lean body mass..based on my height. Based on this equation the average lean body mass for my height not including any weight training induced increases in Muscle Mass is 148 pounds (C= 10.7 for my age). I also know that I am slightly below average, so I assume my ‘natural state’ is around 144 pounds of Lean Body Mass or 65.5 Kg. 370 + (21.6 X 65.5) or 1784 Calories per day. 1784 + 50 or 1834. Is it a big deal or not? depends who you’re talking to. In all of those studies showing a metabolic slow down with dieting and weight loss they found the drop in metabolic rate to be anywhere between 45 and 150 calories per day. So 50ish calories is a ‘big deal’ in some studies to some researchers. Oddly enough, we can account for a large amount of this metabolic slow down by looking at the weights of the internal organs. When severely obese people lose lean body mass while dieting, they tend to do it at different rates. As an example, after a group of obese people underwent a very-low-energy diet (800 calories a day) for 12 weeks (no weight training), they lost 10.5% of their body weight, but saw a 19% decrease liver volume. So the weight loss they experienced was not equal across their entire body. Based on these findings, the question becomes is this a return to a ‘healthy liver’ or a negative side affect of dieting? I’m not sure. In the studies that had obese people lose 10% of their body weight (again on 800 calorie a day diets) it was found that there was a 135 calorie decrease in metabolic rate. Of that 135 calories, 65 calories was explained by the loss in fat and lean mass. Then when the lean mass was divided by the actual sites of weight loss (organs vs muscle), things got even more interesting. only about 55 calories per day was not explained by the changes in organ weight. Finally of those 55 calories it was suggested that improvement in health could play a factor since insulin resistance is known to increase resting metabolic rate. As you’ve just learned, measuring resting energy expenditure is tricky, the equations are best guesses based on averages of people who are similar to you (but whom are NOT you). We also know there is a genetic component to metabolic rate and we know that changes in muscle mass and fat mass don’t have a large effect of energy expenditure. Research is split on the idea of a metabolic slow down with dieting and weight loss. We know we do not see any form of metabolic slow down after 3 days of fasting. But we do see some form of slow down (50-150 calories per day) during prolonged weight loss. However, even this is confusing since we know now we can explain much of this ‘slow down’ as actually being an improvement in health markers. There is some research showing MASSIVE metabolic slowdowns, but these studies all compare measured metabolic rate to ‘predicted’ metabolic rate using the equations we talked about earlier… and we know what a big mistake that is! Finally, we have the anecdotal evidence that typically comes from female fitness competitors and chronic extreme dieters. Who claim that after years of dieting and weights and cardio that their metabolisms have slowed down, stopped or are going in reverse. We can’t discount these stories entirely, but I will suggest that they are confounded by drug use, and a culture that is rampant with restrained eaters who are suffering from periods of disinhibited eating. But I will also say that there is very little research done on women, who are at dangerously low levels of body fat (sub 15%) doing 2 hours of cardio a day, while weight training and dieting to get to even more dangerously low levels of body fat. So I have no idea what they are doing to themselves in this situation. The closest thing we have to study are anorexics who will have a lowered resting energy expenditure, but also have a lean body mass that is more than 1 standard deviation below our venus equations, leading me to believe that some of that weight loss has (dangerously) come from metabolically active organs. Firstly, the idea that your metabolic rate can slow down greatly is a bit of an exaggeration. Yes it can slow down. Yes that slow down may be significant, but we’re not talking about a halving of the amount of calories you burn in any given day. If that were to happen, your metabolic rate would be the least of your worries (something else far worse would be going on in your body). Secondly, your metabolism does not ever shut off completely, unless you’ve died. In which case, again, your metabolism is the least of your worries. So what is the average person to do? Use common sense when trying to lose weight. You CAN lose weight quickly when you in fact have excess weight to lose, but once you start getting into the territory of being lean (~10% for guys ~20% for women) then weight loss should be slow and gradual. My best solution is to think of a healthy range of resting metabolic rate, instead of an absolute best case number. Let’s go back to our equations from the last two blog posts. Let’s take the women’s equations since I’ve been using men in most of my examples. 1200 and 1500 calories per day. So let’s just call that a rough normal range for that height (keeping in mind these equations tend to over estimate). See the previous posts to get the equations and to figure out your own range for your height, age and gender. The truth is, I’m not advocating for having a low metabolism or a fast metabolism, but rather having a healthy metabolism that is somewhere in a range that is suggested for your height. This is why with Adonis and Venus workout programs we don’t worry about metabolic rate… it’s not something we stress over. If you fall within that range you are probably fine. Especially if you ‘feel’ fine. Lower than that and we have to ask why? What parts of your body are not using the amount of calories they should. If it is higher than this we have to ask why? what parts of your body are using more calories than they should and why? But most importantly we have to ask…how would you know? Not all of us have access to a true measure of metabolic rate, so all we really have to work with is how much are we eating and what is happening to our bodies. The vast majority of us do not have the ability to eat as much as we’d like and still lose weight. But I’m not sure that manipulating our metabolic rate is the answer. To me the answer is always eating the foods you like, and aiming to lose weight slowly, and to realize that extremely low levels of body fat are not always optimal. There is a small group of people who genetically can be super-ultra-lean year round, but for the rest of us, we can be lean year round, and we can be ultra-lean for an event if need be, but the goal isn’t to be dieting year round, nor is it to have zero percent body fat. Get lean, stay lean, learn to maintain a healthy level of leanness that makes you happy with your body while eating the foods you like. Maybe not as much food as you wish you could eat, but eating responsibly knowing that the amount you eat is what is letting you have the body you like.